Pharmacist Ezeanya Emmanuel Chetanna,popularly known as Mr Eternity, is a fast- rising Inspirational and Motivational Song writer, Singer, Rapper and Actor. He hails from Nise in Awka South Local Government Area of Anambra State, Nigeria. He is happily married with Three Kids ( The Three Wise Men). 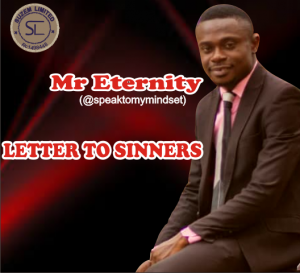 Under the Record Label, SUZEM LIMITED, Mr Eternity has come up with a Soul-enriching hit titled “LETTER TO SINNERS”, to remind us that our journey here on earth has nothing but ETERNITY as the only destination. Download, Listen and Share to touch Souls.